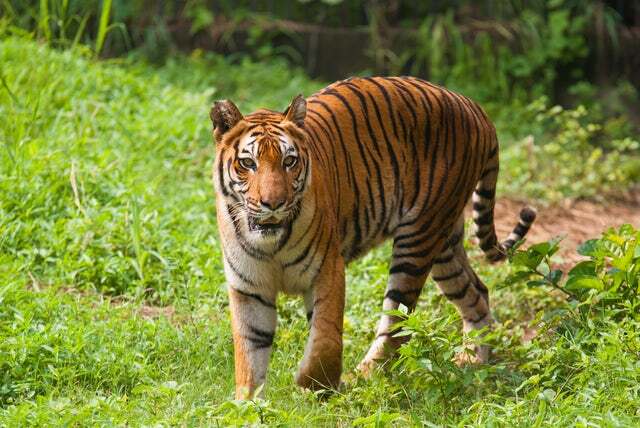 Located in the southeast of the city of Calcutta in the district of West Bengal is a 10,000 square kilometer park that is called the Sundarbans National Park. It forms a large part of the Gangetic Delta that borders the Bay of Bengal. The mangrove forests found here form the world’s largest delta with great rivers such as Ganges, Meghna and Brahmaputra converging on the Bengal Basin. The park is home to rare, endangered and endemic species. Tigers, birds, aquatic mammals and reptiles call this national park home. Sundarbans is decorated by an intricate system of waterways. Some of the channels extend over 1-2 kilometers in width and run in the north-south general direction. Since most of the waterways have been cut off from the mighty Ganges River, they do not carry fresh water. Luckily, the western portion of the park gets some fresh water from the Bhagirathi-Hooghly river system. The park’s landscape is in constant change as it is molded by the action of tides. The erosion that happens on the river and estuary banks is deposited along the inner parts of the park. Note that about half of the Sundarbans is under water most of the year. Since the area is characterized with low lying fields, the silt that is eroded from upstream is deposited here. The area thus boasts rich alluvial islands and mud banks. Towards the sea, you will find the sandy beaches and dunes. The largest part of the park is occupied by mangrove forests - about 4,262 square kilometers. Of this, 2,320 square kilometers is forest whereas the rest is water. Of course you are also going to find some marsh vegetation such as the ones found in the Malayan Peninsula and the Polynesian regions. Mammals – Among the mammals that you are going to find here include; Javan rhinoceros and water buffalo, swamp deer and Indian muntjac, tiger population wild boar, spotted deer, and rhesus macaque. Avifauna – If you love bird watching, the Indian Sundarbans is a haven for them. Among the birds you can expect to spot include; Asian open-bill stork, black-necked stork, greater adjutant, white ibis, swamp francolin, white-collared kingfisher, black-capped kingfisher and brown-winged kingfisher.